To be clear, none of this is to say that much of the emotion and solidarity was not genuine; most often, it was very much so. However, protests for Palestine or against Israel were also instances of populations of Arab countries projecting their own dissatisfaction in a politically “safe” way in light of the repressive nature of the regimes under which they lived. Recently, while trading stories with a Syrian friend about protests, she recalled that her first protest as a child had been one for Palestine — in fact most of the protests she had participated in or witnessed growing up as an Arab living in the West were about Palestine. I nodded and smiled, not at all surprised. The reality is that Palestine, for better or worse, was the issue that most Arabs — both living in the Arab world or in their respective diaspora communities — spent a majority of their lives protesting. Today in the region, a new culture and spirit of protest is thriving — and it is not one cloaked in one issue projecting onto another. It’s direct, it’s forceful, and it’s brave. These uprisings have been as much, if not more, about people exerting ownership over their own lives and communities as it has been about toppling dictators. It is a myth, and quite frankly disrespectful, to the hundreds and thousands of dissenting leaders and youth who helped build the foundation to these uprisings to discuss them as if they were born out of thin air. Tunisia, Egypt, Libya, Yemen, Syria, and others might not have been exploding in revolt for the past three to four decades, but that is not to say there hasn’t been a constant string of imprisoned, beaten, tortured, killed, or disappeared that laid the kindle for the fire to come. However, what is particularly interesting is that what is happening in Palestine today is a sort of role reversal, and if you haven’t been paying attention, you’ve probably missed it altogether. The Arab uprisings across the region are serving Palestinian youth in much the same way solidarity with past Palestinian intifadas served activists and populations in Arab countries. Nowadays, it is Palestinians who have been projecting their own frustrations through solidarity protests. Similar to the case of Arabs protesting about Palestine, it is not as though the emotions are not genuine; they are. However, the protests are serving a much bigger function and one more emblematic of dissatisfaction with the current situation of Palestinian resistance politics than of a simple solidarity with Arab brethren rising up. The division between Fatah and Hamas, an unsuccessful September statehood bid, a flailing Palestine Liberation Organization (PLO) leadership, a return of unpopular negotiations with Israel, and a sharp increase in home demolitions and arrests of Palestinians by Israeli forces has left the activists in a state of decentralized bewilderment regarding where to start and who, if anyone, can or should lead. But every new project is a part of a new conversation and bit by bit activists on the ground are chipping away at a comprehensive approach. Just as protests for Palestine, and in the last decade, for Iraq, served as a training ground for young activists across the Arab world learning lessons on political mobilization, so too have the respective revolution solidarity protests in the West Bank and Gaza. For example, the March 15 movement’sEnd the Division campaign had a practice round with confrontational Palestinian Authority security forces — protests held in solidarity with Egypt one month earlier. Palestinians took to downtown Ramallah’s Manara Square in November to once again stand in solidarity with Egyptians protesting the military regime at a time when Fatah and Hamas were scheduled to meet in Cairo with General Hussein Tantawi. 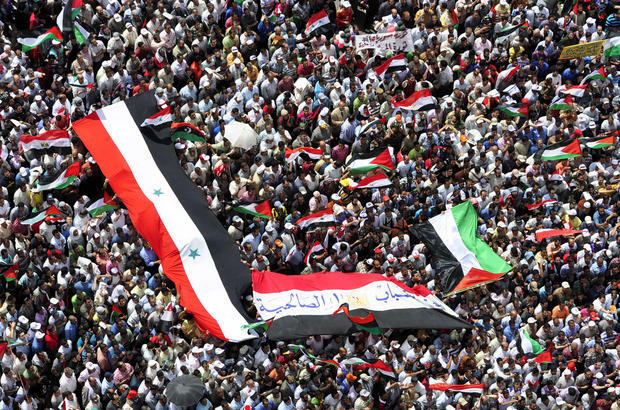 Most recently, it is Syria that has garnered the youth’s focus and since this summer, two solidarity protests for Syria took place in Manara Square. Some of the same activists who helped publicize and lead the charge for the solidarity protests are spreading their wings to more local matters, and for the third week in a row headed to protest in front of the presidential compound, the Muqataa, against the PLO returning to negotiations with Israel. Some have mistakenly condensed their analysis and questioning regarding Palestine and the uprisings by asking when Palestine will join the “Arab Spring,” or when will we see a third intifada. But asking this question reflects a fundamental misunderstanding with the nature of resistance in Palestinian society and the role of its intifadas in the collective consciousness of most Arabs. First of all, yes, we are undeniably not in what we consider a formal intifada, but resistance in Palestine is not limited to a traditional understanding of intifada. It is a constant state of being and a struggle which goes through phases of organization depending on numerous factors; it is a dynamic evolution based in a long history of a community regrouping and redefining the form and language of its resistance. Just as Arabs in the region spent the decades of supposed “quiet” by building and learning, Palestinians, and especially Palestinian youth, are regrouping and reconfiguring. If you think resistance in Palestine is dead, you have not been keeping up whatsoever. No one watching the coverage of the revolutions in Tunisia, Egypt and other countries could help but recall images of the first Palestinian intifada — young boys standing in front of armored vehicles, unarmed and defiant. But jumping from emotional connections and imagery of popular uprisings to assuming that a wave of revolution would sweep Palestine displays the application of an outdated analysis to both what will spark a “third intifada” and what it will look like. For Egyptians, the sheer magnitude of protests on 25 January 2011 — and indeed that it happened at all — was a rupture in their existing imagination. (Of course Tunisia was a rupture in everyone’s imagination of what was possible.) They most definitely built on that rupture, ran with it, and have been pushing forth since. And while the Nakba Day protests in May made for an amazing moment, it was not a rupture in Palestinians’ imagination even close to comparable to that of what was happening in the rest of the region. The days of one single event sparking a mass movement in Palestine have passed. In today’s entrenched occupation, weak political leadership, growing dependence on state donors and nongovernmental organizations, and general fatigue amongst many Palestinians, the third intifada, if termed that, will not look like anything we’ve seen and neither will its beginning. We are going to have to retrain our eyes and imagination to recognize the images of the so-called next intifada in Palestine because it will not ascribe to any nostalgic longing for the image of uprising. Palestinian solidarity protests with the uprisings are only one of a dozen examples (the March 15 unity movement; the May 15 Nakba Day actions; the Palestinian Freedom Rides; the boycott, divestment and sanctions movement; diaspora voter registration for the Palestinian National Council) of a slow, but steady restrategizing and shifting consciousness in youth and activist communities. The third intifada might indeed contain many of the characteristics of its first predecessor. But if the diversity and creativity present in the foundation being built today is any indicator, its beginning will take us by surprise, not because it will be sudden, but because it didn’t look like a beginning at all.